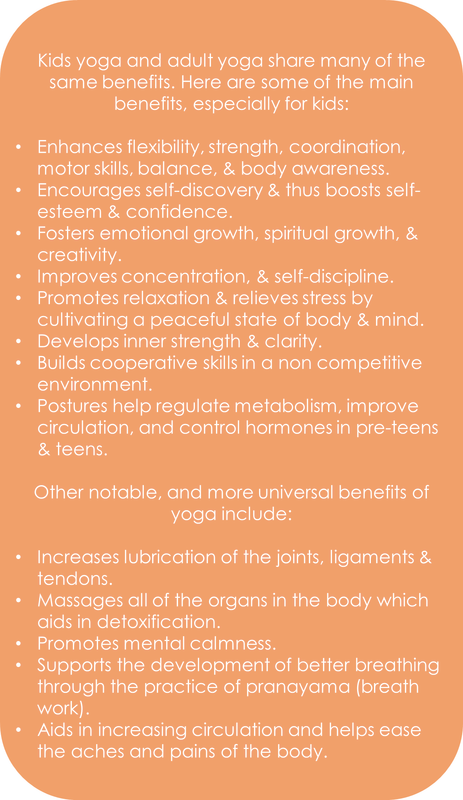 Kids yoga is a fun and inspiring way for children to develop important psychological, physical and emotional skills. Kids yoga classes are fun, silly, supportive, and creative. A nurturing class atmosphere provides the opportunity to make meaningful connections to one's self and others in a non-judgmental and non-competitive way. ﻿"Children can learn almost anything if they are dancing, tasting, touching, hearing, seeing, and feeling information!" We believe that children learn best when they are creating and having fun! To make our kids yoga classes a blasty blast, we incorporate a wide range of sensory experiences, including songs, dancing, art, storytelling, uplifting music, creative movement, age appropriate games, visualization, affirmations, and of course yoga poses. ﻿We live in such a fast-paced world! Children are always on the go with school pressures, competitive sports, lessons, clubs, groups, and part-time jobs. These pressures and additional responsibilities create stress for children. This is the norm in our society today, however with all of this added stress - there is very little focus placed on stress relief. This bustling pace of our children’s lives can have a profound effect on their innate joy – and usually not for the better. Stress can manifest itself in may ways; from physical disorders to a negative self-image. Yoga can help counter these pressures and stress, and can also provide a sense of physical connection and community in a highly digital world. When children learn techniques for self-health, relaxation and inner fulfillment, they can navigate through life’s challenges with a little more ease. Stress relief is key! A poll was done by the National Association of Health Education Centers on children between the ages of 9-13 years old. It was reported that school was the number one source of stress with family second and friends third. The effects of stress pose a health risk and can also inhibit learning in children. The relaxation techniques that yoga provides can help to manage stress. Improved concentration and self-discipline in the students would reflect greatly in the classroom environment. There are a number of studies that have found positive correlations between yoga participation and academic performance. Emotional growth, spiritual growth, and stimulated creativity can help develop students who are community oriented. This can be associated with forming the leaders of the future, a common goal of all academic institutions. Rates of ADHD diagnosis increased an average of 5.5% per year from 2003 to 2007. If this number continues to increase as it has in the past two decades, coping tools for students will be continue to be necessary. Yoga can provide the required tools to help students relax, and the techniques are easily transferable in the classroom setting. Relaxed children = more focus! According to the PREVNet association, bullying is at it's highest in the elementary school years with over 60% of girls and 47% of boys in grade 1 being victimized. The trend seems to decline towards grades 5 and 6, but then increases again in the junior high years being at one of the higher points in grade. Since yoga can help develop inner strength and clarity in children, their communication skills between peers and teachers will improve which can be cause for an immense decrease in bullying. Enhanced flexibility, strength, coordination, motor skills, balance, and body awareness for students means that overall athleticism in the school will improve. More active students means healthier students, which could help reduce absences. Improved athleticism also correlates to winning more sporting events at a city, provincial, and national level. For this, school are recognized highly.